We are building a home in Southern California at the Beach. It is about 2,600 square feet. Alot of glass. Our heating contractor has installed a hot water fancoil by ESP company. He says Heat Loss on the coldest day of the year is about 60,000 BTU and that his fancoil would need about 9 GPM @ 140 degrees to heat the house. The plumber is installing the water heater and is also installing a a small radiant zone in the basement. The plumber has installed a Navien NCB 240 combi boiler. It has 199,000 BTU. The contractor who installed the fancoil has expressed concerned that the one unit is not a good choice for the Hot Water Fancoil load + Domestic Hot Water and 400 sq ft of Radiant. He does not think it can supply enough heating and bathing water at the same time. I would like to get some independent opinions. Any help would be appreciated. 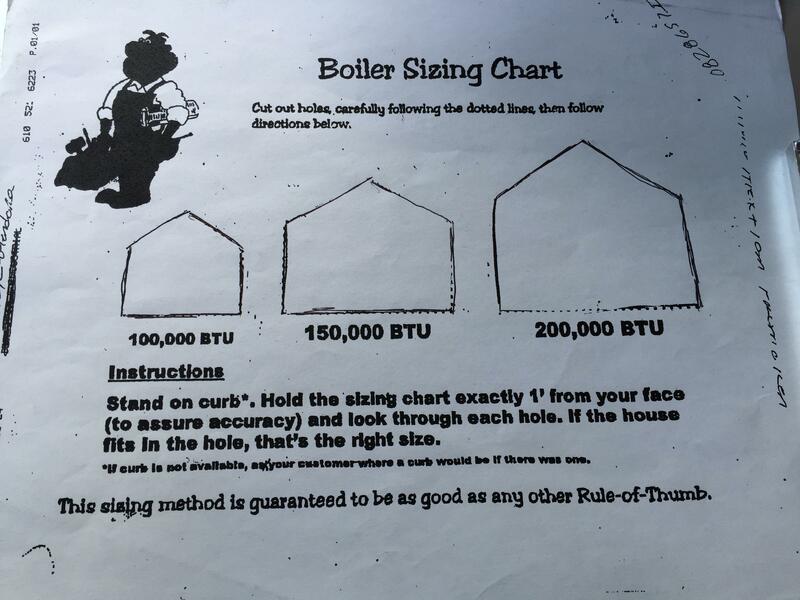 If those numbers are correct, your heating guy wants only a 13 degree drop across the coil, which most of us would consider overpumped. 5-6 GPM should be sufficient for a properly sized coil. If the Navien is big enough to supply the domestic hot water demand, there will be no shortage of extra BTU's available to heat the house. I would be more concerned about short cycling there, actually. But even so. How do we get 6 GPM to the fancoil and 5GPM to the faucets at the same time? First of all, it doesn't happen at the same time. The boiler has a function called domestic hot water priority which switches an internal 3-way valve, stopping the flow of water to the heating system during a DHW call. We don't install or service Navien, so I'm not familiar with the specific details of interfacing that to the air handler -- since you will almost certainly want to slow or stop the fan(s) when that happens. When the unit is properly set up, it will supply a varying water temperature to the air handler based on the outdoor air temp. This will provide increased comfort and longer fan run times. Your HVAC contractor (or designer, or engineer) really needs to know this stuff intimately. Having the HVAC guy do the coil and ducts, but the plumber doing the boiler (especially if the plumber does not have hydronics expertise) is probably not a good idea. 65,000 BTU/hr at 10GPM = 13°F ΔT across the coil. You might be able to get by with less, if the coil is properly sized. This sounds like a nice house, with what has to be a pretty decent budget. I would give serious consideration to a separate, properly sized, hydronic boiler for that kind of project. The numbers you are seeing in the manufacturers literature are what they test at . Those numbers can be changed around and still deliver the same amount of heat while not overpumping or using that much electric or pumping power . Your contractors should know this but most don't and are scared to deviate for lack of knowledge . 130* at 9 GPM for 60000 . 13* Delta as has been mentioned already . Navien that was tested for AFUE at a 20* Delta through the boiler . Nothing you are about to receive is or will work seemlessly . That flow rate could very well be 6 GPM and your boiler / combi would perform better with colder water entering it . Yes , colder water promotes more condensing and the Wetter the Better for this type of boiler . Also mentioned already is the fact that this boiler will not send heated water to your coil during a domestic hot water call . The Ncb 240 is 199,000 btus for domestic hot water and is 110,000 btus for heating. The combi boiler shuts down the call for heating to take care of the call of DHW. Also on the NCB unit there is a set of dry contacts or interlock to shut down a fan for hydro air installs on call of DHW. I would highly recommend a buffer tank with this set up to eliminate short cycling with the radiant floor. This unit has a min btu rating of 18,000. Beach house with lots of floor to ceiling glass? 23 BTUh is still a very high load .I question those numbers . SoCal lots of afternoon sun , Cannot even believe it is accurate . That equals the load in many leaky houses I replace stuff in located in NJ with a design temp of 10* that are equal in size . Is something missing , what are we not aware of ? Yet another reason to use a separate, properly sized heating boiler. Maybe this contractor is only selling equipment with round BTUs . Silly me, everyone knows you add a section for DHW!